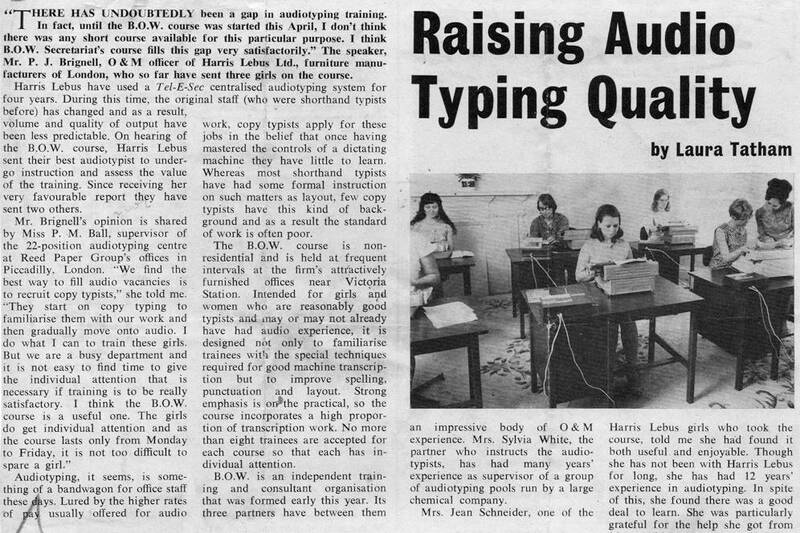 “THERE HAS UNDOUBTEDLY been a gap in audiotyping training. In fact, until the B.O.W. course was started this April, I don’t think there was any short course available for this particular purpose. I think B.O.W. Secretariat’s course fills this gap very satisfactorily.” The speaker, Mr. P. J. Brignell, O & M officer of Harris Lebus Ltd., furniture manufacturers of London, who so far have sent three girls on the course. Harris Lebus have used a Tel-E-Sec centralised audiotyping system for four years. During this time, the original staff (who were shorthand typists before) has changed and as a result, volume and quality of output have been less predictable. On hearing of the B.O.W. course, Harris Lebus sent their best audiotypist to under-go instruction and assess the value of the training. Since receiving her very favourable report they have sent two others. Audiotyping. it seems, is some-thing of a bandwagon for office staff these days. Lured by the higher rates of pay usually offered for audio work, copy typists apply for these jobs in the belief that once having mastered the controls of a dictating machine they have little to learn. Whereas most shorthand typists have had some formal instruction on such matters as layout, few copy typists have this kind of back-ground and as a result the standard of work is often poor. The B.O.W. course is non-residential and is held at frequent intervals at the firm’s attractively furnished offices near Victoria Station. Intended for girls aod women who are reasonably good typists and may or may not already have had audio experience, it is designed not only to familiarise trainees with the special techniques required for good machine transcription but to improve spelling. punctuation and layout. Strong emphasis is on the practical, so the course incorporates a high proportion of transcription work. No more than eight trainees are accepted for each course so that each has individual attention. B.O.W. is an independent training and consultant organisation that was formed early this year. Its three partners have between them an impressive body of O & M experience. Mrs. Sylvia White, the partner who instructs the audiotypists, has had many years’ experience as supervisor of a group of audiotyping pools run by a large chemical company. Mrs. Jean Schneider, one of the Harris Lebus girls who took the course, told me she had found it both useful and enjoyable. Though she has not been with Harris Lebus for long, she has had 12 years’ experience in audiotyping. In spite of this, she found there was a good deal to learn. She was particularly grateful for the help she got from Mrs White in overcoming her personal difficulties, one of which was confusion about the correct placing of apostrophes. Both Mrs. Schneider and the 20 year year old from the Reed Paper Group who attended a B.O.W. course liked Mm. White personally an important factor in successful training. Mrs. Schneider remarked that Mrs. White made certain one worked hard—a point evidently respected. The girl from Reed also found it helpful to have her dual deficiencies pinpointed and, since the course, has taken a renewed interest in her job, says Miss Ball. A rather poor speller, she now looks up in the dictionary those words she is unsure about and learns them. She is also taking advantage of Reed’s half-day release scheme for study at the City College for Further Education for the RSA audiotyping certificate. Is the effectiveness of the course lessened for trainees who at B.O.W. use dictating machines of a make other than that used in their companies? No,I Was told unhesitatingly. Differences between machines so far as controls go are not sufficient to cause any difficulty. 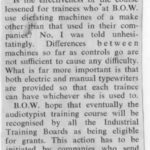 What is far more important is that both electric and manual typewriters are provided so that each trainee can have whichever she is used to. B.O.W. hope that eventually the audiotypist training course will be recognised by all the Industrial Training Board as being eligible for grants. This action has to be initiated by companies who send trainees, who must ask the Board under which they come to make its own evaluation. The course is also open to any individual who wants learn audiotyping skills and brush up her background knowledge. This should be of assistance to many married women who want to return, after an interval, to part- or full-time work but lack confidence after several years away from offices. Finally, a footnote for those organisations interested in helping the physically handicapped. Among the audiotypists at the Reed Paper Group is a blind girl who, says Miss Ball, is just as efficient as her sighted companions. 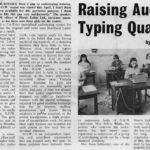 Though blinded only six years ago she is able to use an ordinary typewriter with the addition of a small Braille attachment that acts as a benchmark to guide her in layout and tabulation.